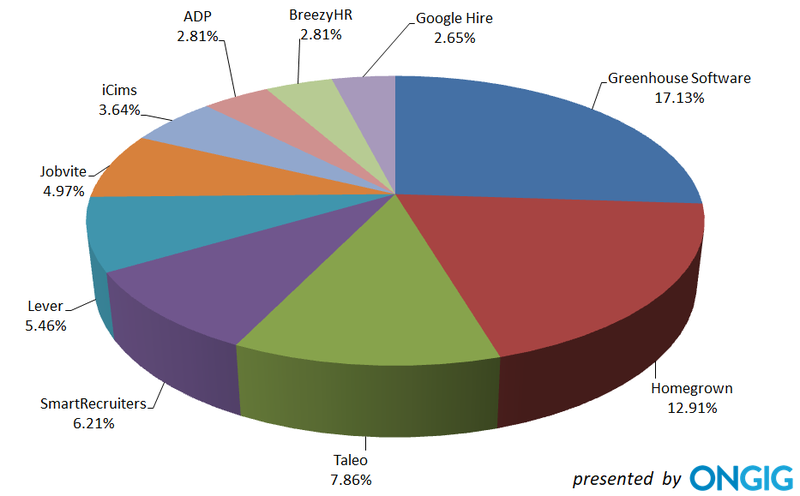 So, every year the Ongig team and I find the top ATS’s used by employers actively hiring…and we publish the details. We fine-tune this list of top applicant tracking systems based on community feedback — 117,000 people read the last 3 reports and 100+ commented. Thank you! First, a bit on the criteria. Ongig can’t survey every employer on which ATS they use. Instead, we focus on the employers doing the most hiring as measured by number of open job descriptions. This year’s report tracks 4,218 top hirers and the ATS they use. The employers we track range from a large company like Amazon with 13,000+ open positions to a small startup currently filling just a handful of roles. It turns out they use a total of 109 ATS’s among them. 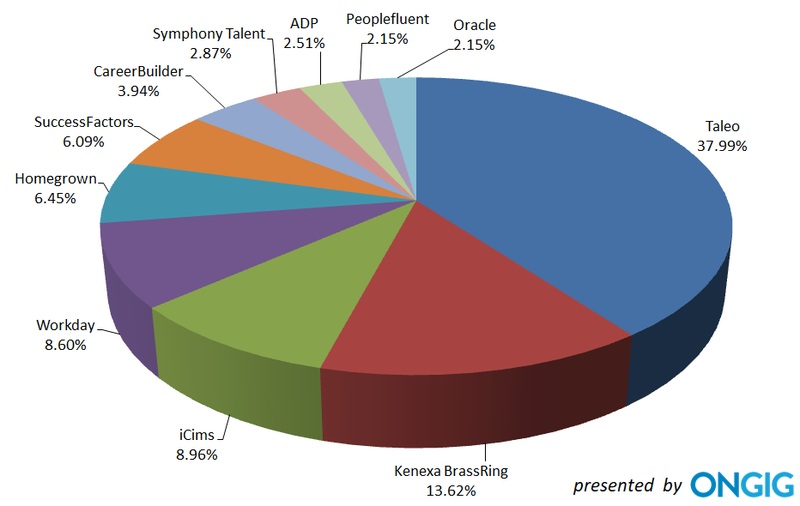 The first pie chart below shows the ATS market share of the top 20 ATS’s. 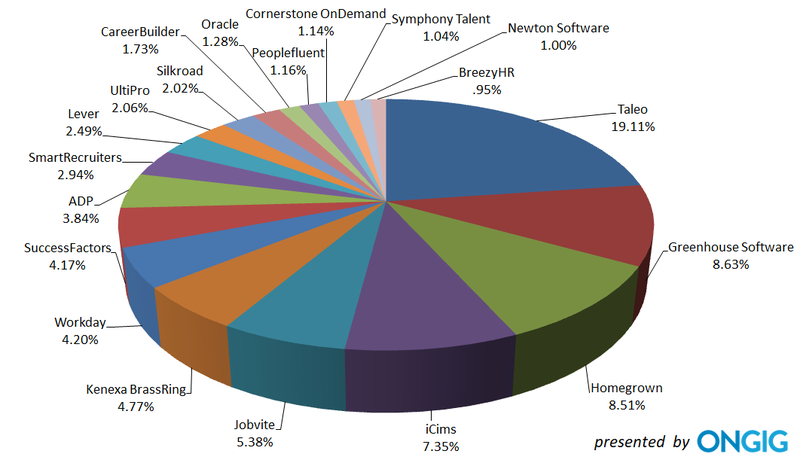 Note: You’ll note “Homegrown” listed as an ATS in the pie chart and table. That is not the name of an ATS. Instead, a homegrown ATS is ATS software built by the employer themselves. Many top employers (including Google, Facebook, Apple, Starwood and Wyndham) have used a homegrown-built ATS at some time. 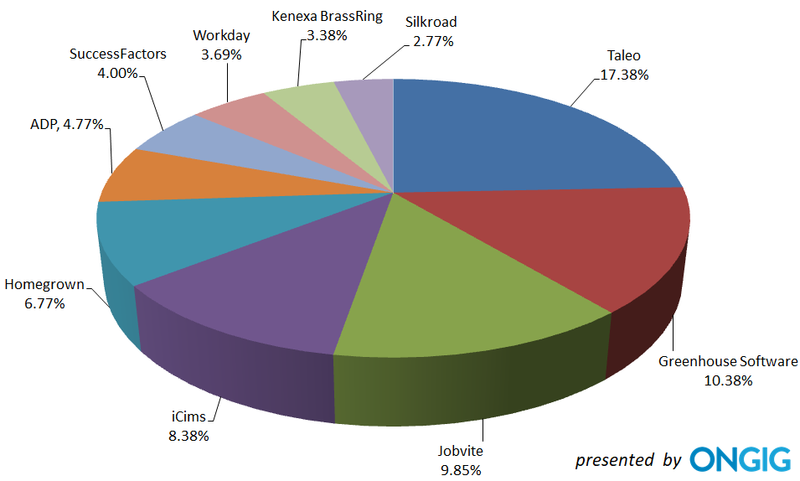 Here’s the full list of applicant tracking systems (109 in all) by market share. Note: The applicant tracking system list above has 109 ATS’s in it and ends on row 78 because a number of ATS’s tie for market share. The ATS market share #s we provide in this report are for installations of ATS’s and not ATS market share by revenue. For example, we show Greenhouse edging out iCIMS in terms of ATS market share usage in this report yet iCIMS likely has much higher revenue than Greenhouse (because iCIMS has been around much longer and has a higher concentration of large clients). If you want to get more granular, we break down the top applicant tracking systems by hiring volume. Afterall, the type of ATS you need for a new startup versus one you need to hire 50,000 people this year is very different. That way, you can look at how many open positions you have and figure out the top ATS systems used by other employers hiring a similar volume. 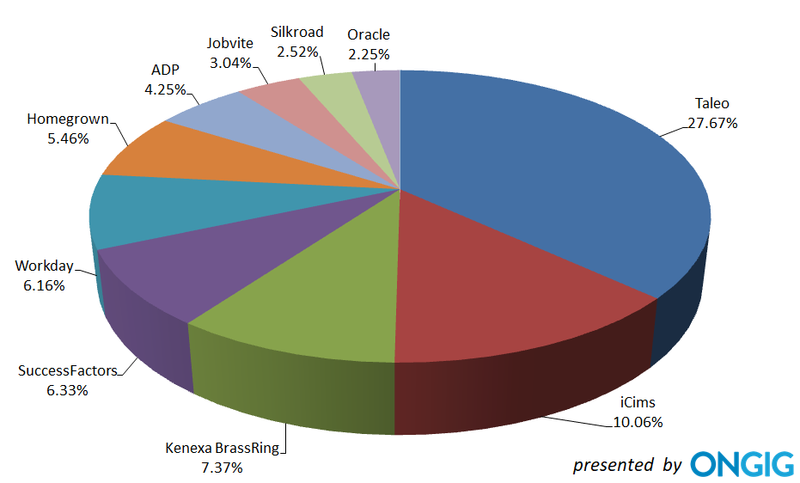 The pie charts above show a snapshot in time of ATS market share. But the ATS market share is changing fast so we must also look at growth. Growth in # of new ATS clients added — These are the top ATS’s by number of clients added among the top 4,000 hirers we track. For instance, Greenhouse Software has added 140 new clients in the last 12 months among the top 4,000 hirers that we track. However, they added many more clients that we do not track. % Growth of new ATS clients — This group includes top ATS’s by % growth in new clients (again, among the Top 4,000 hirers we track) over the last year. Growth in ATS market share points — This group includes the top ATS’s by change in market share for an ATS in 2018 versus 2017. For example, if an ATS went from 2% market share in 2017 to 6% market share in 2018, the gain would be 4%. These 5 ATS’s grew fast and they didn’t make the charts above only because we had low sample sizes for them. Other ATS systems growing fast in adoption include Balancetrace, Paycom, Birddog and AcquireTM. We noticed a number of major employers migrating from one ATS to another. 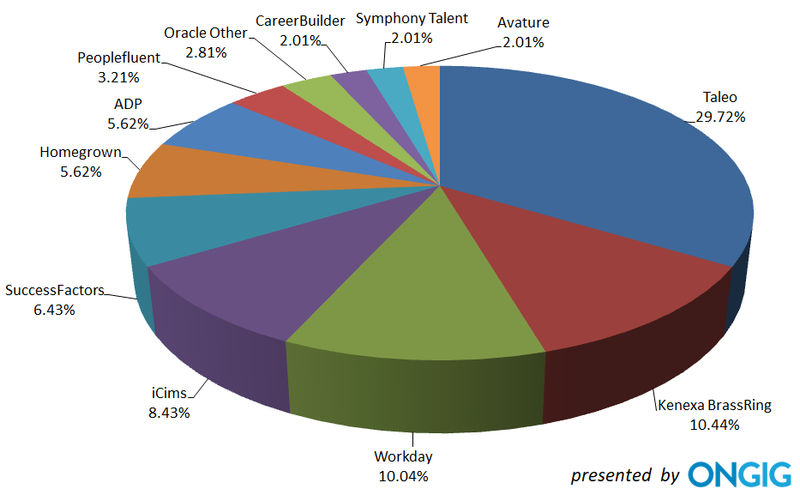 The most common ATS systems that top employers migrate to are Greenhouse Software, Workday, Taleo and iCIMS. There is a battle going in the ATS market. On the one side, you have Human Capital Management (HCM) Suites like Oracle, Workday, SAP and Ultimate Software — they provide ATS software as well as a suite of other HR software. The major benefit is that it’s one-stop shopping. The drawback is that it can take a long time to launch and then smooth out the wrinkles. For instance, we hear of many examples of major employers taking 2 to 3 years to migrate to Workday. On the other side you have “best of breed” ATS systems (like iCIMS, Greenhouse, SmartRecruiters and Lever). The main benefit of a best-of-breed ATS is that you can more easily add 3rd party software applications (video interviewing, sourcing, credit checks, etc.). For example, iCIMS and Greenhouse each have about 200 3rd party “integration partners” to add value to their ATS without you having to leave your ATS. The main drawback of a best-of-breed ATS is that you may have to do extra development work to get the pieces to work together. We expect the ATS market to continue to consolidate. Recruitment Marketing — Talent first needs to be acquired and there’s plenty of recruitment marketing software to help you do that. The ATS — The candidate needs to be tracked until they are hired. Notice how the ATS is smack in the middle. I expect that the strategic positioning of the ATS will cause it to be a key chip in the game of recruiting software consolidation (including mergers and acquisitions). For instance, PrimePay (a payroll company since 1986) just added both an ATS and on-boarding to its payroll solution. You might recall that another payroll company, Paycor, acquired the Newton ATS back in Dec. 2015. However, we also expect to see our list of applicant tracking systems grow 12 months from now when we update this report. The ATS market can be so lucrative that there are new ATS systems popping up every week. Some lists of ATS’s are 200+ long! Newer ATS’s like Greenhouse, Lever and SmartRecruiters began their business targeting startups — but they continue to go “upstream”, landing much larger clients. These newer ATS’s are following the same playbook that iCIMS used. They first targeted the small and medium-sized market and then moved upstream to larger enterprises (iCIMS is now the ATS for most of Amazon, one of the largest hirers in the U.S.). Google continues to make headway with their new ATS software. They could be a top 10 ATS if they really go for it. Afterall, this is Google — they have super-smart engineers and a ton of cash to work on this for a lawwwngg time (see 7 Reasons You Should Care About Google’s New ATS). The Google Hire ATS isn’t yet for everyone (they seem to be targeting only customers of their G-Suite solution (Gmail, Google Docs, etc.). So, if you’re using Microsoft Outlook for email, they won’t try to convert you to their ATS (yet!). Most of Google Hire’s current customers have less than 25 job openings. A telling milestone for the Google ATS is whether/when Google uses Google Hire as the ATS system for its own huge volume of internal hires. That would mean that Google scaled it to be a true enterprise-level ATS that could appeal to large Fortune 500-level employers. The reason we publish this free Top ATS Report is that our Ongig recruiting software integrates with applicant tracking system to help employers transform their job pages and boost quality candidate applications. So, we need to stay on top of the top ATS software and how they’re doing. Ongig solutions include Branded Candidate Experience, Text Analyzer (including diversity), Job Description Rewriting and Custom Videos. I hope this report was useful to you! We welcome you to comment below.